Image caption Smith said this year's nominations suggested Hollywood was "going the wrong direction"
"We're uncomfortable to stand there and say that this is OK," he told Good Morning America's Robin Roberts. 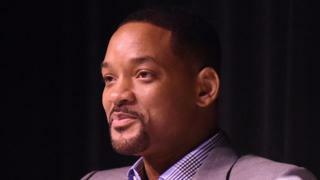 In an interview aired on Thursday, Smith said diversity was "the American super-power" and that, "at its best, Hollywood creates the imagery for that beauty". When he looked at this year's all-white line-up of acting nominees, he went on, "it's not reflecting that beauty." "Everybody is beautiful and deserving and fantastic, but it feels like it's going the wrong direction," he continued. "There's a regressive slide towards separatism, towards racial and religious disharmony and that's not the Hollywood I want to leave behind." The Independence Day actor, however, insisted his own part in the debate was nominal. "This is so deeply not about me," he said. "This is about children who are going to sit down to watch this show and they are not going to see themselves represented." Smith's comments will add further fuel to an issue that is threatening to overshadow this year's awards, to be held in Los Angeles on 28 February. They will also heap further pressure on Rock, whose role as host of the ceremony is increasingly becoming divisive. "Please do not do the Oscars awards," wrote rapper 50 Cent on Instagram. "You mean a lot man, don't do it. Please." Fast & Furious 7 star Tyrese Gibson has also called on Rock to step down. The actor said there was "no joke that [Rock] can crack" that would make up for the Academy's failure to nominate a single non-white acting nominee. "There is no way for him to seize the moment... and say, 'I'm going to say this and say that I'm going to address the issue but then I'm still going to keep my gig as the host'," Gibson told USA Today. "The statement that you make is that you step down." Media captionActor Dustin Hoffman says the Oscar nominations are an example of "subliminal racism"
Speaking at Wednesday's National Television Awards in London, Dustin Hoffman said the all-white line-up was an example of the "subliminal racism" that exists throughout American society. In an interview with the BBC's Will Gompertz, though, Birdman star Michael Keaton said the Academy's voters had not been "maliciously prejudicial" in overlooking black and other minority actors for the second year in succession. "I just think they're possibly out of touch," he continued. Mark Ruffalo, Keaton's co-star in journalism-based drama Spotlight, is one of the 20 all-white candidates up for this year's acting accolades. At the London premiere of Spotlight on Wednesday night, the Avengers star said he supported those calling for a boycott "in essence" but would still be attending the ceremony. "I have a lot of sympathy for [the boycott] and I completely understand why people are protesting. They have to," he told reporters. "Except I'm in a movie that's representing a whole other group of disenfranchised people who have no voice in the world and this movie means so much to them. "And so... I have to demur and I have to stand up for the people I have to stand up for." Released in the UK on 29 January, Spotlight tells of an investigation by journalists at the Boston Globe newspaper into the widespread sexual abuse of children in the Catholic Church. Talks of a boycott have been stoked by Spike Lee and Jada Pinkett Smith's separate declarations that they would not be attending or watching this year's event. In an interview on Wednesday, however, Lee said he had never used the word "boycott" in a statement he posted protesting against the "lilly white" event. The Do the Right Thing film-maker also said he would "support [Rock] either way" whether he chose to host the Oscars or not. Record producer Quincy Jones is another to have qualms about attending the Oscars, revealing he had been asked to present an award on 28 February. "I'm going to ask [them] to let me speak for five minutes on the lack of diversity," he told the Hollywood Reporter. "If not, I'm not going to [present]." Rock himself has largely kept his counsel about his presenting role, beyond calling the Oscars "The White BET Awards" in a promotional tweet for the telecast. The joke refers to the annual awards presented by the Black Entertainment Television network that celebrate the achievements of African Americans and other minorities in music, acting and sports. When Rock previously hosted the Oscars in 2005, however, he took numerous jabs at the Academy, describing the event at one point as "kinda like Def Oscar Jam" for including four black actors among the acting nominees. Comedian and talk show host Arsenio Hall is among those calling on Rock not to step down, tweeting that it was "so important" for him to be "on the mic[rophone] that nite [sic]." Comedian Kevin Hart, meanwhile, told Radio 5 live on Wednesday that "this should not be thrown on [Rock's] shoulders". "Chris Rock is a person who has no problem speaking his mind," he said. "What he chooses to do with this platform is his choice." Michael B Jordan and Britain's Idris Elba are among other stars who some feel were unfairly overlooked this year in favour of white performers. Elba delivered an address at the Houses of Parliament on Monday in which he called for greater diversity in the media, the full text of which is now available online.